Microsoft send out word that Flight, its upcoming flight simulator, will be free-to-play. Today, Microsoft Studios premiered Microsoft Flight, a PC game that lets players jump into the challenge, fun, and freedom of flight. 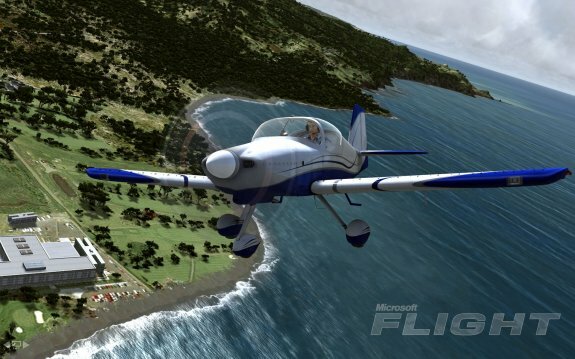 Microsoft Flight will be available as a free download this spring, giving players the freedom to fly the skies over the beautiful Big Island of Hawaii, complete a variety of exciting missions, test their skills in flying challenges, or find hidden aerocaches on the island. In addition, players who sign in to their Games for Windows – LIVE account automatically receive additional free content, including the legendary Boeing Stearman plane, supplementary missions, and access to Achievements and an Online Pilot Profile. Those looking to deepen their experience can purchase and download additional content that adds new aircraft, regions and customization options. The frequently released new content for Microsoft Flight includes daily aerocache challenges and updates that make every flight unique and fun. Microsoft Studios worked with the personal airplane manufacturing team at ICON Aircraft to give aviation fans the exclusive opportunity to fly the all-new ICON A5 before real-world production starts at the end of 2012. Designed by the world-class aeronautical engineers behind the Voyager spaceship, X-Prize winning SpaceShipOne, and Virgin Galatic’s SpaceShipTwo, the ICON A5 is the “jet ski for the skies,” a high-wing amphibious monoplane with a carbon fiber airframe and a comfortable, automobile-inspired cockpit with space for two. The ICON A5 will be the first aircraft available to players for free in Microsoft Flight. “ICON Aircraft and Microsoft Flight both share the goal of making the fun of flying accessible to everyone who’s ever dreamed about it. ICON does this by fusing world-class product design with the very best engineering, and Microsoft by combining the excitement of a great gaming experience with the authenticity of a top notch flight simulator,” said ICON Aircraft CEO Kirk Hawkins. Today the team behind Microsoft Flight released an exclusive video that features all-new footage of Microsoft Flight. To view it, click on the 'Video' tab. Additionally, sign-ups for beta are still open! Be among the first to try Microsoft Flight by applying for the closed beta at: https://connect.microsoft.com/site1134/InvitationUse.aspx?ProgramID=6087&InvitationID=FLY-BRQX-BXTB. The voyage continues at this year’s Consumer Electronics Show in Las Vegas from January 10 – 13. Those that attend will have the chance to play Microsoft Flight before it releases this spring at the Microsoft booth, located in the Central Hall.